(<<< CLICK to ENLARGE — the thumbnail at left is a former blog header) Discovery, bathed in lights, is seen near center in long view against clear, black Florida night as she headed toward Launch Pad 39A at 9:10pm Monday, January 31, 2011. The Crawler, on which the shuttle rides, moves about a mile an hour on its best days. And the Crawler's mileage? If you have to ask, you can't afford one. Launch: No earlier than, Thursday, February 24, 2011. Orbiter Discovery Roll-Out from the Vehicle Assembly Building to the Launch Pad overnight January 31-February 1 began about 8 pm and in the early hours of February 1. Generally Roll-Out takes about 6 hours. Discovery has been to the pad for this launch before, but when cracks in the fuel tanks caused concerns, she was returned to the VAB. The STS-133, Orbiter Discovery, launch was further re-scheduled on January 7, 2011, to no earlier than February 24 2011. No launch time has been designated for that date. This is a further delay in this much delayed mission, and now moves this mission to 2011. This is the second to last of the scheduled Shuttle launches. 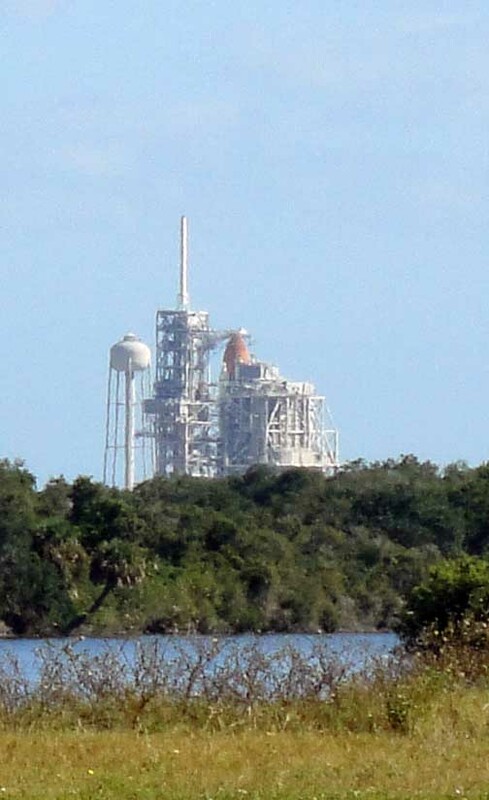 The original launch date for STS-133 was last summer; the most recent was February 3, 2011. The final mission, STS-134 has been scheduled for launch in March 2011. However, there may be one additional mission following STS-134 to provision the International Space Station — sometimes it is on; sometimes it is off. 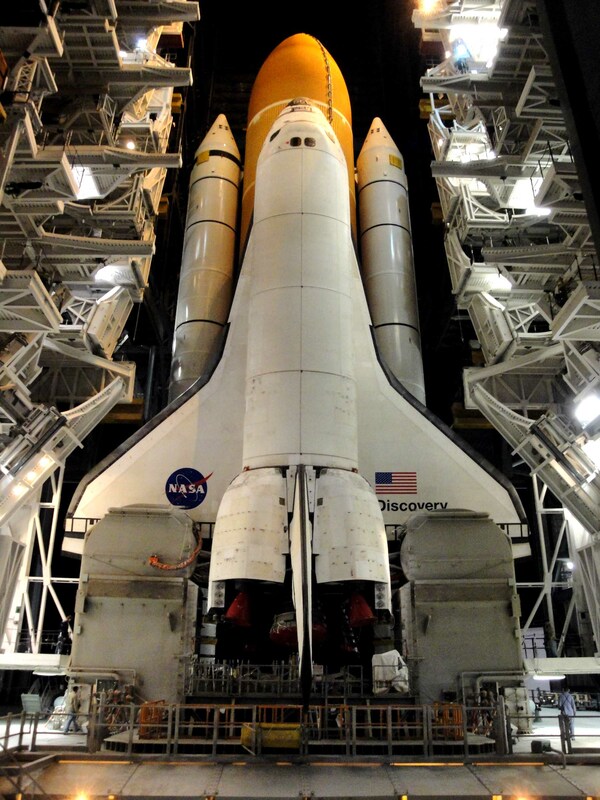 Latest NASA launch schedules can be found HERE. In the years following the truncated end of the Apollo program in December 1972, NASA found itself with excess hardware intended for later Apollo missions, and not much money to go fly again. Worse, the landing on the Moon had been an all-encompassing goal, as political as scientific, and once accomplished, interest in NASA waned and forever after NASA would lack a clear goal and mission – a situation that continues to today. NASA did have things in its pipeline. The Shuttle which was to go into Earth orbit was on the way, but in 1972 it was years away, and would be delayed even longer than anyone expected. So NASA made do. Theory used some of that old Apollo hardware to build and launch Skylab – a huge laboratory that pre-dated today’s International Space Station by decades. Skylab did several launches, including the highly political joint mission with the Russians in 1975, but soon enough rockets and extra hardware was used up and Skylab was parked in an orbit where it would have to await the arrival of the Shuttle to bring new scientists into space. It was not a perfect plan, but it was a plan. But like plans that go awry, this went badly awry. The Shuttle development was delayed and would fly several years after it was expected to. And then the Sun erupted and the resulting sunspots changed the orbits of Skylab. In the end, she burned up in the atmosphere, and as would happen again for NASA later, NASA was building a vehicle – the Space Shuttle – that would have nowhere to go except to joyride in orbit around the Earth and to do limited scientific experiments in cramped spaces. As always politicizing and the political appoints who ran NASA then, and now, put a happy face on it, especially when in 1981, the Shuttle finally came into service. In the years following the end of the Apollo program I followed NASA only leisurely and from afar. I was accredited to cover at least one Skylab mission, but skipped it. If anything really significant had been going on, I guess I would have covered it. In those days, and well into the Shuttle program that I would cover a lot, NASA as an organization remained energized and innovative – and proud. It’s not hard to see why that would all change as one replacement after another for the Shuttle was announced, and scrubbed for 30 years and as designs and re-designs of a replacement for Skylab went on and on, as the Shuttle fleet flew and aged. In the end, during the 1970s, I largely watched this from afar. But in 1981, I decided to cover NASA again. I flew out to Edwards Air Force base and stood in a stone cold desert before dawn. I watched the shuttle Columbia come out of the mist, home from space, More than 2,000 journalists from around the world were with me that morning. We were watching the re-birth of America’s space program and we thought, largely incorrectly, the beginning of a new age of scientific experimentation. Blog Photograph, © joint copyright 2010, The Grove Sun Daily and Seine/Harbour® Productions: On November 1, 2010, Space Shuttle Discovery is seeen from the 39A Media Site at Kennedy Space Center in Florida. Discovery was Florida awaiting its final launch into space which was t have taken place about 4 p.m. on Monday, November 1. The STS-133 mission was widely expected to be the second to last Shuttle mission ever, although there was recurring talk of an additional mission after the March 2011 STS-134 mission to supply the International Space Station (“ISS”). Header photograph, left, used for this post, and now replaced, © joint 2010 copyright, The Grove Sun Daily and Seine/Harbour® Productions: Bleachers for the STS-133 Tweetup at the 39A Media Site with the Vehicle Assembly Building on right. NASA kept the Tweeters separate from the legacy media and provided Tweeters with more interesting speakers including, at an earlier launch, the Deputy Chief of NASA who ran into a buzzsaw when she tried to softsoap some Tweeters in the Tweet Tent. After giving a rambling 22 minute answer, she fled trying to out-sprint legacy newspaper and TV reporters who she had refused to meet with.